What is heritage? Is it the physical remains of the past? The literal, tangible objects of art? The physical bits of culture? Or is it how we experience them, interact with them…how we incorporate them into our lives via actions, reactions and memory? Today Scottish social media exploded with the news that the Glasgow City Council has logged planning permission to raise the plinth of an equestrian statue of Wellington in Royal Exchange Square. Why? To keep the populace from placing traffic cones on Wellington’s head. From what anyone can gather, for at least 30 years Glaswegians have, after a night of revels, crowned this Category-A listed monument to the hero of Waterloo. Wellington+cone has become one of the city’s most memorable sights: a stop for tourists and a point of shared cultural tradition among the city’s residents. The image is available on postcards, t-shirts, coffee mugs, etc. The act of placing the cone and, indeed, the presence of the cone the next day, is considered by many to be a display of the city’s sense of humor and the good-natured revelries of its inhabitants. People are proud of that reputation and they are proud of Wellington’s cone. Why is the City Council trying to stop this practice? A series of articles that came out recently cite a planning permission document offered by the City Council’s Landscape Design Manager. They claim that the act of cone-placing is dangerous, that the statue is harmed by the practice, and that cone removal costs the city 10,000 pounds a year. All three of these claims are questionable. By raising the plinth they make the practice (which will not stop) more dangerous. The statue seems to be taking the climbing just fine and, indeed, they could preserve it by allowing better access to the statue’s head via some sort of step. Finally, the claim that it costs so much to remove the cone is in direct contradiction to the City Council’s response to a Freedom of Information request that my friend Gavin Doig lodged on the topic last year. So why, then, is the Council trying to ban statue cones? I believe that the key is in the wording of the council application. 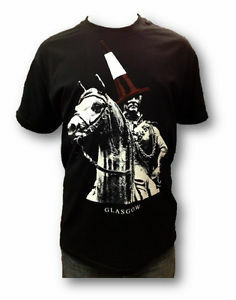 It calls the cone a “depressing image of Glasgow”, in contradiction to the popular idea of the cone being a representation of jollity. What they mean is that it is a low image of Glasgow: a drunk and silly Glasgow, an unclassy Glasgow, a Glasgow that takes the piss. They believe that the coned statue is base. I believe it demands respect. I also believe they are entirely wrong. Some of the classiest locations are secure enough in their own culture and traditions to allow for statue silliness. Here are a couple that I thought up on the walk home. Over the door of the Great Gate at Trinity College, one finds a small statue of Henry VIII, who consolidated three other colleges into Trinity (giving it that name despite the fact that my college was already called Trinity). 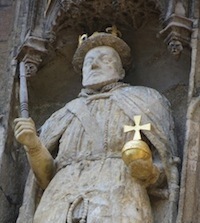 As the founder, he is depicted over the gate. In one hand he holds a globe. In the other…a table leg. In days of yore he held a sword, but it was replaced by students at some point in the distant past. Did this, the fanciest of Cambridge Colleges, remove the table leg? No. It remains as a wonderful discussion piece. A warning against taking the whole Cambridge thing too seriously. Indeed, sometime in the 1980s the table leg was replaced with a bicycle pump. It was left in place for a while but the College eventually put the table leg back. The statue of John Harvard’s shoe is constantly rubbed. In the middle of Harvard yard one cannot help but pass the seated statue of John Harvard. It is a favorite among tourists and residents for three reasons. First, as there was no portrait ever made of John Harvard, the statue has a generic face; it is a depiction of the idea of him, but not actually him. Second, the statue is labeled ‘Founder’, but Harvard was not the founder of the University, he was but a donor. Finally, people love that one is meant to rub his left shoe for luck and, perhaps, to get into Harvard. Nearly every tourist who passes through Boston rubs John Harvard’s shoe. Nearly every resident of the city has given it a rub once or twice. As a result, the shoe is being slowly worn away. It is bright and shining, a different color than the rest of the metal. Eventually, it will break. It will happen. Yet there has been no attempt by Harvard to raise the plinth and stop the practice. To not allow people to rub John Harvard’s shoe would consign the statue to insignificance. To prevent this beloved modern tradition would be to stop the statue’s primary use to viewers. Indeed, who among us has not found oneself with a cone upon their head (or equivalent) after a jubilant night out? I’ve had at least one cone that I can remember. 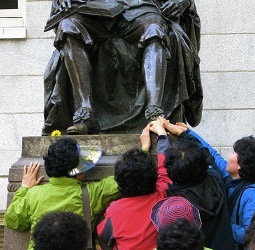 Harvard and Cambridge are fine with comical interaction with statuary, and are proud of the way that the public interacts with public culture. The creation of a popular tradition is something to commend and to celebrate. 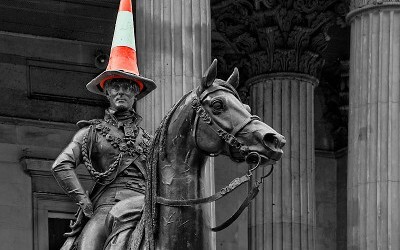 The placing of Wellington’s cone appeals to all of Glasgow: it is a practice that everyone relates to irregardless of race, religion, or social class. It is shared heritage and it makes the city and its inhabitants unique. Because I love heritage and culture. I think that far too often people in a position of power with a very set view of the world (and often a massive inferiority complex) make heritage decisions that the majority of the populace doesn’t relate to and, eventually, that everyone comes to regret. Usually this has to do with heritage and traditions that do not fit the classical, cultured ideal. It is expression that fancy folks find to be base. Sites and objects that classy people see as ugly and shameful. In early 2010 I got into a bit of a newspaper op-ed row in central New Zealand. A freezing plant was being torn down in a small town without any consultation with the citizenry. A petition was started by local school children to have some dialogue about this action: they felt the plant was part of their heritage and its chimney something that made up their identity. They wanted a chance to talk about preserving part of it. 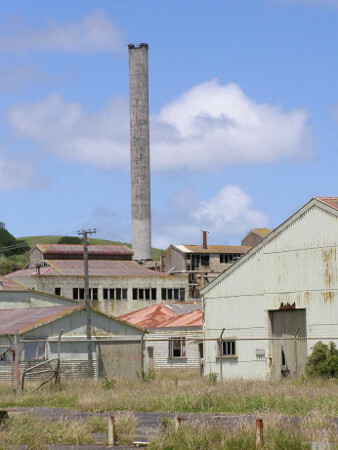 Because I think such things are important, it is worth noting that the local pols who wanted to remove the plant were White, and the people who wanted to discuss the matter were Maori. My letters were published in full as I waxed sentimental about the preservation (or not) of old mills in my native Columbus, Georgia. The responses I got from the pols were redacted due to foul language. There was an announcment that a meeting would take place to discuss the issue. The plant was then secretly pulled down in the night before the meeting. The argument was that the plant was ugly so no one invested in the town. Of course now there is STILL no investment in the town and the people have lost a point of culture. Great job team. I felt the same way about the removal of Checkpoint Charlie and the Palace of the Republic in Berlin. The removals happened fast, without discussion, because people in power didn’t like that heritage. It didn’t matter how many people locally and globally cared about those spots. They were in the way. They are gone, we can’t have them back. I see the Wellington Cone as more of the same. The Council is making a decision that suits their own aesthetic ideals for the city: some poorly constructed idea of civility and decency that proves that Glasgow isn’t what everyone says it is. However, Glasgow IS what everyone says it is. It is an open, fun, and friendly city. It is a welcoming place filled with people who are, to put it bluntly, not so up their own arse that they can’t see the humor in 30 years of a statue with a traffic cone on its head. I like living in the jolly Glasgow, the self-aware but not self-conscious Glasgow. I don’t want to live in an authorized, sanitized, cone-less Glasgow. How boring!